On commencement of employment in CIT, IT Services will provide you with your email address. 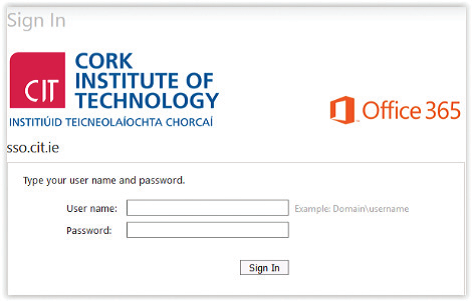 The email address is in the format of firstname.surname@cit.ie and includes an initial, if required. A password is given to use for the initial log in and this can be subsequently changed. The username is in the format firstname.surname. Due to security policy, passwords must be changed every 75 days. Passwords must contain a minimum of 8 characters and include uppercase and lowercase letters and have a/numbers. Setting up Microsoft Outlook on your PC to access your email - Microsoft Outlook is part of the Microsoft Office Suite. At the login page, you simply input your username and your password. 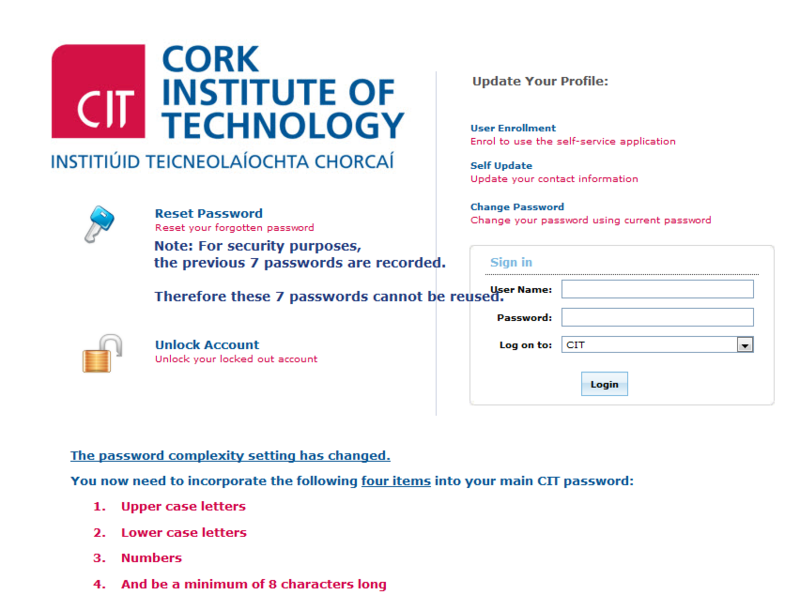 You can enrol in the password self-service system at http://password.cit.ie, which will allow you to reset your password any time. Sign up for this service as soon as you receive your account and you will automatically receive an email 7 days before your password is due to expire, prompting you to change it. This reminder email will subsequently be sent every day until you change your password. Remember, when you change your password on your PC, you will also need to change it on all other devices (e.g. phone and laptop) that you use to access CIT resources. Failure to do so will result in you being “locked out” of your account. This can also happen if you enter an incorrect password 3 times. A call to the Servicedesk (ext. 5050) will rectify this problem.